The photograph won the Pulitzer prize. The photographer, Kevin Carter, later committed suicide (while the fame and controversy of this photo may have contributed to his death, it seems more complex than that). While the ethical questions of this photograph are important and complicated, that’s not what interests me. 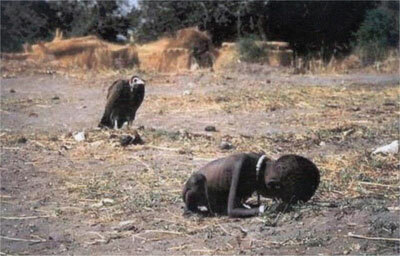 What I found so intriguing about this photo is that it’s simply a little girl starving to death. When it comes down to it, something so incredibly simple and basic is killing her. The reasons for that suffering are much more complex, but in the end it’s pretty basic. She needs food and water. As damning as the photo is and as complex as the entire situation may be (are civil wars ever simple? ), in the end it’s pretty simple. That’s part of why I’m asking for water for my birthday. It’s staggering that something as simple as not having clean water is killing people. 4,500 children every day, to be exact. That’s a stupid reason to die. And as complex as the reasons may be for why these people don’t have clean water, the reason to act is pretty simple. Water=life. That’s a pretty simple cause when you get down to it. There aren’t many people who will argue and protest the idea of giving starving people food or thirsty people clean water. Clean water is kind of a no-brainer. We may not agree on everything, but I’m hoping clean water is something everyone can agree on. And if that’s all a little too heavy for you, perhaps a photo site of a completely different magnitude: Awkward Family Photos (thanks to Jason Boyett).